Configurations – McCourt laser sheet labels – both blank and imprinted – come in 36 standard configurations. Custom configurations are also available. Quality – McCourt prides itself in producing the highest quality laser sheet labels for laser, table top, ink jet, copiers, and high-speed printers in the industry! We are ISO 9001 registered. 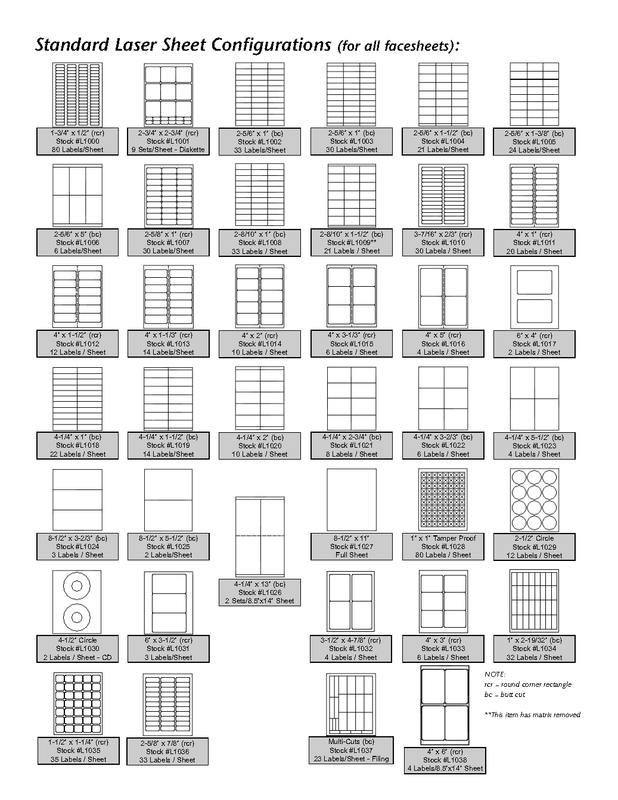 Packaging – All 8-1/2″ X 11″ sheets are available in full packages of 100, 250, 500, or 1000. Delivery – Blank laser sheets ship within 24 hours on standard configurations. Imprinted laser sheets ship within 72 hours after proof approval. Customer Service – Your account representative is a highly-trained and experienced label consultant. Call with your requirements and your account rep will provide you with the best label solution in the industry at a competitive price. Adhesives – All configurations are available with permanent, removable, and all-temp adhesive. Please call your account rep to request a custom adhesive. Facesheets – In addition to our standard facesheet, film and premium/bright white facesheets are available. Colors – Imprinting can be done in up to 6 colors. We have 8 standard color choices (custom colors are available) – black, 185 red, warm red, reflex blue, process blue, pantone green, process yellow, and 165 orange.